My name is Andy Nygaard and 20 years ago, I knew absolutely nothing about Lake Okoboji UM Camp. I didn’t know about singing graces, Morning Watch, or Boji-ball. That all changed in the summer of ’98 when I started my 5 year adventure working at camp. 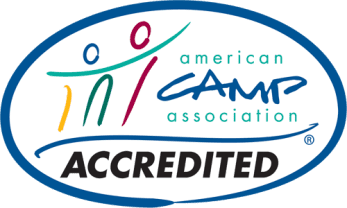 While I was never a camper as a kid, working there allowed me to have many of the same experiences, like building lifelong friendships and growing closer to God. Seeing what can happen at camp, I knew I wanted to pass that along. As a staff member, I took two of my nieces to Guardian and Angel camps. Even though I knew the schedule and all the activities we would be doing, I got to be a first-time camper with many of the other guardians in the group. With that first Guardian and Angel camp, my family became lifelong campers. I’ve watched those two nieces grow up attending camp each summer, becoming J-staff, and eventually working summers at camp. Their youngest sister is now old enough to also J-staff, and their brother continues to be a camper. My parents have also become volunteers over the years, helping in the kitchen when they can. And now it has become my family’s turn. My wife, Katie, who I met at camp, took our daughter to her first Guardian and Angel camp a few years ago. She now cannot wait to return to camp next year. 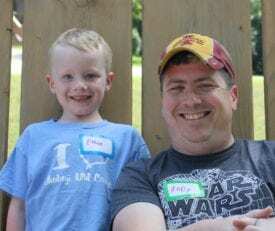 This past summer, I finally got to return to camp with my son. Being back at camp brought back a flood of memories, but also helped create new memories for my son and me. As I walked around camp, reminiscing on old friends and memories, I started to notice how much camp has changed. Buildings are gone or have been added on to, the trees are all so much bigger, and the growth of activities on the south campus is great to see. But with all the change and growth camp has seen over the years, many things are still the same—the most important being the presence of God that has been felt for over 100 years. I look forward to bringing my kids to camp for many years to come. I know those memories and friendships will last a lifetime.